*When possible, buy freshly harvested vegetables at the farmers market for the highest nutrient value. Rinse all the vegetables well, including the kombu. In a 12-quart or larger stockpot, combine the carrots, onions, leek, celery, potatoes, sweet potatoes, yam, garlic, parsley, kombu, peppercorns, allspice or juniper berries and bay leaves. Fill the pot with the water to 2 inches above the vegetables, cover and bring to a boil. Remove the lid, decrease the heat to low, and simmer, uncovered for at least 2 hours. As the broth simmers, some of the water will evaporate; add more if the vegetables begin to peek out. 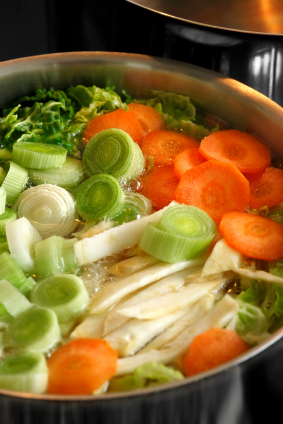 Simmer until the full richness of the vegetables can be tasted.